If you have downloaded some MP4 video files or captured some MP4 videos using your camera, these videos are likely to be compressed with H.264 or MPEG-4 video encoding, because these two codecs are normally used to compress MP4 videos. While XviD is the name of a popular video codec, and its quality and efficiency have made it one of the most popular video codecs online. In order to convert MP4 to XviD on Mac (Mojave, High Sierra, Sierra, El Capitan, Yosemite, Mavericks, Lion, Mountain Lion included), the article would guide you step by step. Firstly, search a professional software tool to support you to convert MP4 to XviD on Mac. 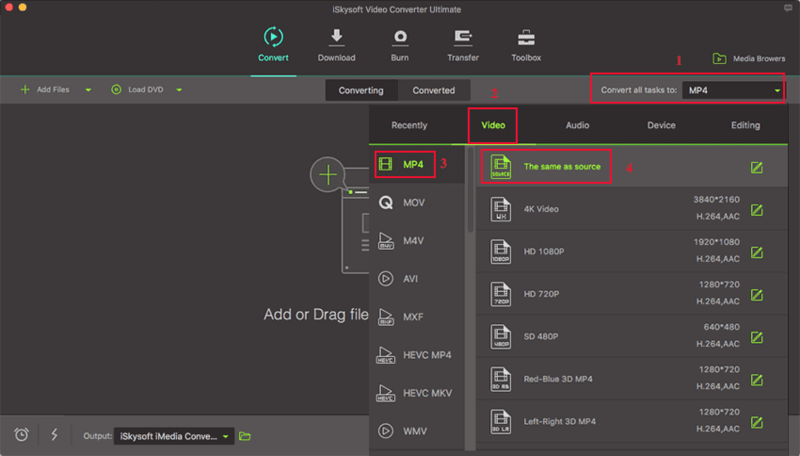 Here we introduce you to an outstanding iSkysoft Video Converter Ultimate which comes with high conversion speed that can convert MP4 to XviD quickly and effortlessly with zero quality loss. All-in-one:	Convert, Burn, Download or Edit video easily. Convert video in more than 150 formats, like MP4, XviD, MOV, MKV, AVI, WMV, etc. 90X faster speed with new Algorithm Technology, converting video in seconds. Download Video online by copy URL or Recording. Convert video to DVD with pretty templates. Compatible with macOS 10.17 Lion to newly 10.14 Mojave; Windows 10/8/7/XP/Vista. 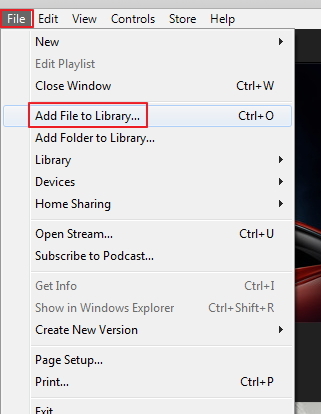 Go to the main menu, and select "Add Files" option to import the MP4 files to the program. Or directly drag the target MP4 files from your local folder to the Mac MP4 to XviD converter, the files will be loaded automatically. Batch conversion is supported. After imported the MP4 videos to the converter, follow the click steps in the screenshot below to choose XviD as the output format. You can find it under Video tab. What is more, this MP4 to XviD converter comes with powerful editing tools and you can trim, crop and add effects or subtitles to your videos. You can click the edit icons below each video's thumbnail to proceed. Click the "Convert All" button at the bottom right corner and this smart Mac video converter will start to process the MP4 to XviD conversion on Mac. After a few seconds, you will get the MP4 file in XviD format. When it comes to online MP4 to XviD converter, you would be amazed to find the array of options available in the market. But, the most important fact is, finding the right one that meets your need. Free online video converters help you save money as well as space on your computer. You can convert videos right away from MP4 to Xvid without much hassle. 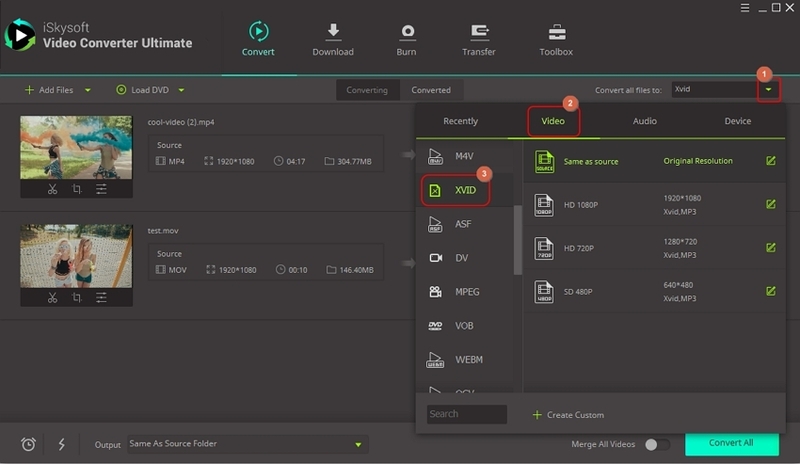 When it comes to MP4 to Xvid video conversion, KeepVid video converter seems a viable option. This converter is 100% free of cost. You can convert both audio and video online, without installing it on your computer. it runs smooth on most web browsers and converts videos sans any quality loss. It supports a wide range of video formats, including MOV, AVI, WMV, MKV etc. The site converts videos 30 times faster than that of the counterparts. More than 1000 types of audio video formats are supported by this site. You can even easily edit videos using this online video converter. Step 1: Head to https://www.keepvid.cc/ and hit on the ‘Choose File’ button next to ‘Add a File’. Now, locate the desired MP4 file. Step 2: Next, select the output file type by clicking on ‘File Type’ and select ‘Video’ as Xvid is a video format. Step 3: Lastly, opt for the ‘Xvid’ format option from the next section and hit on ‘Convert Now’ button. Note: There are limitations for MP4 to XviD converter online. They convert video at slow speed and have strong connection with your Internet situation. Also, after conversion, you will have to download the converted file from it, which makes chance for virus sometimes. Besides, they have limitations for video size and length. While desktop converter like iSkysoft Video Converter Ultimate can avoid all of these drawbacks. This online MP4 to Xvid converter is available for free. You can convert files up to 50 MB size. This tool supports various major file formats for conversion into Xvid movie. It keeps your files private while maintaining the security aspect as well. Once, your file gets converted, it’s been destroyed on their part so that no one else on the web can access it. This site offers you options to either upload a video from your computer or download it online from a link. Step 1: Visit the URL https://www.ofoct.com/video-converter/convert-to-xvid-movie.html and then drag drop your preferred MP4 file into the ofoct converter’s interface. Step 2: Let the file to be uploaded. Once done, select ‘Use Original’ checkbox for same output quality and then hit the ‘Convert’ button to initiate conversion. It supports 3024 types of video conversion. This site can convert 284 types of documents, images, spreadsheets, archive, ebook, audio, presentation, and video formats. It has a very clean interface and is intuitive to use. So, you don’t have to be a professional to use this website. All that you need is your file that you need to convert and the job is done within few clicks of the mouse. Browse https://convertio.co/mp4-xvid/ and then drag drop the desired MP4 file into the Convertio interface. Once done, hit on Convert and wait until the conversion completes.